We all love a bargain and it's even better when you can access it all in one place. I've mentioned Love The Sales in a previous post but in summary they have clothes, shoes, bags, jewellery, electricals and lots more all on their website! 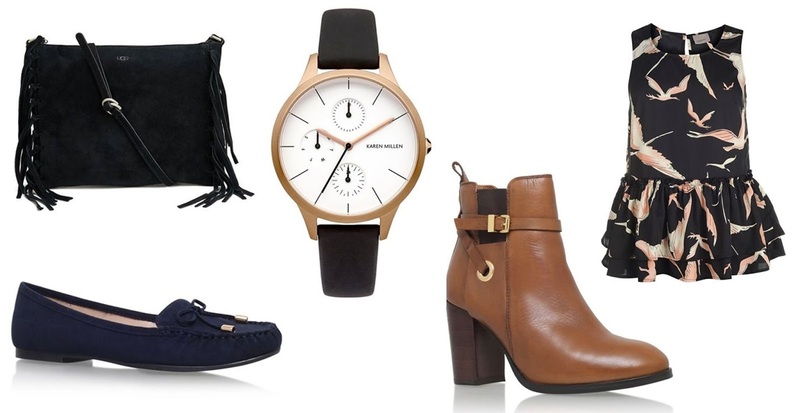 I've picked a few items that I have been lusting after recently. We all know how much I love handbags and I fell in love with this suede tassel black bag from UGG. It's a cross body bag which is super easy to throw on when you don't feel like carrying a handbag over your arm and the colour means it is really versatile and easy to wear with any outfit! At the moment I'm in need of some spring shoes to wear in the transition period between seasons, I have a lot of summery wedges and winter boots but not too much inbetween! I spotted these suede blue loafers from Carvela which I think are perfect for wearing with jeans but also with dresses and smarter outfits, I love the bow detail and again, the colour will go with almost every outfit! I also found this Karen Millen watch which I absolutely love, I adore how classic and simple it is. I really like the mix of gold and black, I think it works really well together and the whole watch just looks simple yet sophisticated. Even though I have quite a few pairs of boots, I don't own any heeled tan boots. These ones are from Carvela as well and I think they are extremely versatile and could easily be worn in spring with dresses or with jeans and a spring top! I tend to prefer heeled boots to make me look slightly taller and make my legs look slimmer! Finally is this peplum style top from Vera Moda. I have a few items of clothing from Vera Moda which I absolutely adore already and I really love the look of this top, I really love loose peplum tops as I find them really flattering! Have a little browse around Love The Sales here!